Craig Seymore with his “Heaven sent” therapist, Nicole Sturgill, DPT. Absecon resident Craig Seymore is a long time Atlantic City Water Company employee, nearly 16 years. One day last April while at work, he bent down and felt as if he an electrical shock were coursing through him. And that day at lunch he lifted his hand to eat and felt the shock again. By the next day he was so weak, he could not stand. A visit to the ER found no underlying cause, so then began an unwanted adventure going from care setting to care setting, from doctor to doctor. Months later, a doctor at Rothman watched him walk and knew something was terribly wrong. She sent him to neurologist Dr. Jeffrey Boxman, who in turn sent him to Dr. Jorge Eller, and interventional neurosurgeon with Jefferson Neurosciences at AtlantiCare. Dr. Eller removed a benign cyst that had been growing on Craig’s spinal cord, and sent him to Bacharach for inpatient rehabilitation. 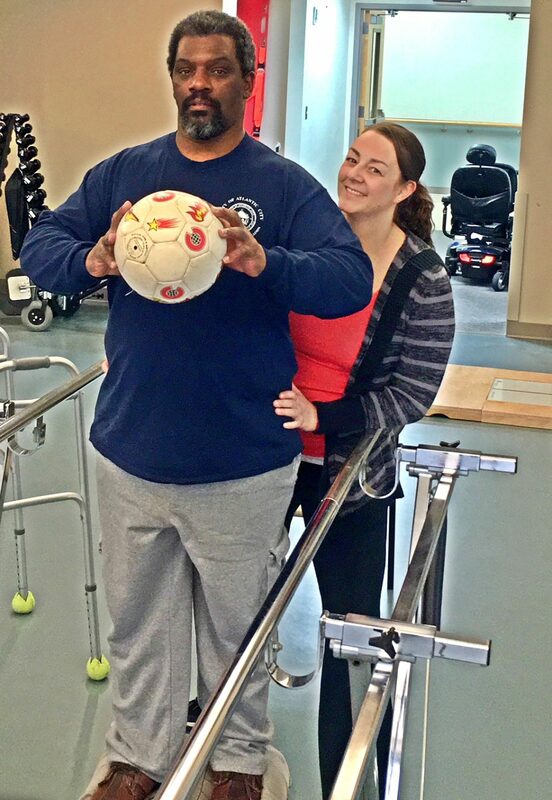 For five weeks he worked with Christa Smart, PT, Apollo Vergera, PT and Christine Henshaw, OT. “Nicole understood my situation. After surgery I could only walk 6 steps. I couldn’t even put my shoes on or brush my teeth. The smallest things were a struggle. The hardest part was starting. Now I can climb the steps and stand on my own without holding on to anything. With Nicole I can walk 40 feet in the hallway.